I was at the playground with the kids this morning and I couldn't help but overhear the mom pushing her baby two swings down agonizing over what to put in the goody bags for her soon to be one year old's birthday party. Bless her. Birthday parties are not my charism and I have mad admiration for moms/dads/anyones that can throw down in the kid birthday department because ... I am lacking. Maybe because last year Julia's birthday fell on the last day of Simon's month of nights and I was in the throes of first trimester nausea with Phoebe (never ever lacking excuses around here) but I felt like I could've done a little better. We took Julia to Chick-fil-A for lunch with another family and her "cake" was a couple of Dora cookies we picked up at the grocery store on the way to said lunch and I'm feeling a little more motivated this year to purchase at least one present (yes, I have three days left but the power of Prime is on my side) and improve on the cake situation. ... and now she has sadly high hopes that Mama Martha will be able to replicate. Hold that breath, folks. 1. Carpe Diem t-shirt - Love it. They also have a super cute Girls Just Wanna Have Fun shirt but it's nice to have shirts that Sebastian can wear too. 2. Jones Market Necklace - I have an adult version (different colors) of this and really love it. Phoebe can gnaw on it and not contract gum or tongue cancer and it's cute. I have to admit my ulterior motive to get her this would be to replace her pink plastic Minnie collar that she can be found wearing ... everywhere. 3. Joules Rain Boots - Julia and Sebastian just went through crazy growth spurts. Sebastian is up four shoe sizes from last year at this time while Julia is right behind him having jumped three sizes. I'm having none of my usual eBay luck finding rain boots but have had these open in my browser for several days. I'm a huge rain boot advocate for kids because they can put them on themselves - even if they do repeatedly put them on the wrong feet (and of course the whole public sphere will be sure to tell them so ... :)). 4. Sparkle Leotard - J started ballet this past weekend and loved it. We have quite a few hand-me-down leotards but a lot of them are almost inappropriately small and I thought this one was cute because she is very much into all things sparkles these days. 5. Boogie Board LCD Writing Tablet - this is a bit of a cheat because she has this already but she LOVES (how many times can I cram the word, "love" into this post? 99 million, watch me) it. My mom bought it for her and is a genius grandma for doing so. I love it too because she can take it places and is easily entertained trying her hand at a backwards version of every letter of the alphabet and then seeking my praise and approval. It's great (really). 6. Holy Heroes Coloring Book - another cheat! Holy Heroes sent us a stack of beautifully illustrated coloring books and I'm holding off on giving them to her until Saturday (her birthday) and these are a very welcome departure from her usual Dora coloring books. If she doesn't nap (unlike today .... hallelujah) she likes to color (her crayon privileges are sort of back on the table - if the boys are asleep) or talk to me about everything under the sun. 7. Thank You, Amelia Bedelia - Maybe she's a little to young for these books but they used to crack me UP back in first and second grade. I'm willing to bet she would find Amelia's antics hysterical because she thinks any and all of her own made up knock-knock jokes are hilarious. Anyway, this is a not-so-sneaky and blatantly transparent way to go about asking you for your toy help? 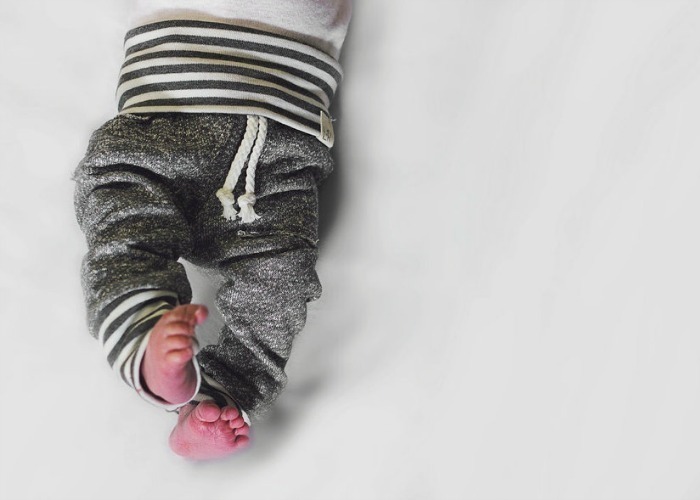 I know a lot of people do the something to wear, something to read, and something to play with rule when it comes to kids birthdays and Christmas and I've got no problems with the two former categories but would love your help with the latter. I hate to be picky and say, "nothing with a million pieces like a puzzle .... " but Theo and Sebastian are master destroyers and are very skilled at flushing/tossing/scattering her precious things all over the house so ... maybe not a puzzle? And any elaborate cake baking luck you might be hoarding pretty PLEASE send it my way. Amelia Bedelia is great. I love her. But when we did a touring theater production of Amelia we found that kids younger than 1st grade (maybe some advanced K and pre-K I suppose) just didn't get her. But I am all about buying the books kids can grow into so more power to you. I agree with the age recommendation...I would also suggest you check a couple of these out from the library and after the kids are in bed read them aloud 10-15 times before you decide if you still like them. My children love these, but by the third page I'm tired of saying "Amelia Bedelia" every seventh word. Peggy Parish must have had a thing against personal pronouns when she wrote these. You can substitute your own as you go, but once your kids know how to read they will hold you accountable to reading all the words. However, I would recommend Calico Critters for an imaginative girl. My 3-7 year old girls absolutely love these, so she won't soon outgrow them...and when she does, Phoebe will be ready to step in and play with them. Be forewarned that they come with some very tiny pieces, so for my younger ones I open the packaging before we give them and remove some of the teeniest things until they are able to keep them off the floor (and, therefore, out the crawler's mouth). They aren't cheap, but are well made with great attention to detail and (this won't help you out for her birthday, but...) there are usually some good BOGO Black Friday sales. calico critters are the best! i loved them so much! okay that's really good to know! will hold off for now :) Thanks Madeline!! My kids definitely don't quite get the humor (John Paul is *just* starting to, and he's 5), but they adore her as a character and love the books! Maybe grab some from the library and test those out first? They're also not indestructible, so it might be annoying having non-board books that you care about that the younger kids would destroy! I've found Duplos to be my favorite "toy that everybody plays with" - might be a worthwhile Christmas present for all of them to get a Lego table and a big duplo starter kit (with some of the princess add-ons because Julia will go nuts for those!) because they get played with ALL the time by all of my littles! This might sound weird, but when I was about her age my parents got me a tent. I loved to play in that thing and bohemian teepees are super popular right now! you're right! I had one when I was little and LOVED it. Smart! Land of nod has adorable teepees. A little pricey but definitely a gift for all 4 kids. My little boy loves the circus tent we got from Ikea for $20 and his cousins of all ages play in it too--theother day I found the 11 year old lounging in there reading, haha. Also, a small play kitchen, or even just the Melissa &Doug wooden food sets would be fun for Julia. Maybe since she likes princesses and making up stories she would be able to entertain the boys and herself for a while with it... or maybe the reusable stickers would get eaten. My go-to for little girl toys is always books, dress up clothes, or purses filled with little toys like stickers and hair bows (present within a present... birthday inception). Just want to second this idea. I got my daughter this and it entertained her for the longest time. Completely worth it. As a non-mother-but-frequent-gift-giver I am a big fan of the activity table. Legos, water activities, colors, etc. Also, I think that cake would be pretty easy to hack with a box base, wafer cookies, cones and dollar store accessories. You can do it! Good call on the wafer cookies and cones. That is exactly what it looks like! Magformers. Loved by our 3 olders (6-2) and can't be swallowed by the baby! Win for all. My 3 yo daughter LOVES Magformers, and my older sons love to play with them too. Last Christmas, they were given money by their great-grandparents to pick out a toy on their own and this is what she chose after much deliberation. Worth it completely :)! P.s. Sorry for the super long link! iPads are not kind to blog commenters. Happy shopping! I was really big into Polly Pocket and little pet shop when I was her age... I know they are not the sam ( late 80's, 90's kid) but are any similar things like that still made? I loved playing vet, and having Polly go to the Spa and swim with the Dolphin she owned. The pet shop lives! Just less of a choking hazard? and every parents worst nightmare, but my friends and I really did play with Polly Pockets for hours. This one being an all time fav! Dress up stuff like the Melissa and Doug doctors kit, duplos (maybe princess themed), her 1st pack of bubble gum (Grace's favorite birthday gift this year), play dough + tools, a color yourself and disposal puzzle from Target for $1, or princess dress up outfit / ballerina tutu from costco. Grace loves all that stuff and she just turned 4. I second the tent idea. My big one got a circus tent from ikea for her 2nd birthday and at 3 is still obsessed. She uses it for camping, as an observatory, a zoo, basically a crazy amount of stuff. Added mom bonus it holds a massive amount of stuff so I can usually kick large quantities of stuffed creatures in their while nursing and voila create the illusion of a clean room! Has Julia read any of the Magic School Bus books/seen episodes on Netflix? We thought S was too young until she stumbled upon one in a waiting room. Now we are singlehandedly responsible for the Kirkwood Library never having any available. Inside the Human Body has been a big fave as Dad works in the ER. Just a thought! We have that ikea circus tent and my 10 month old loves LOVES it! Has since she was about 6 months old. Make a sheet cake(or buy one) with pink icing. 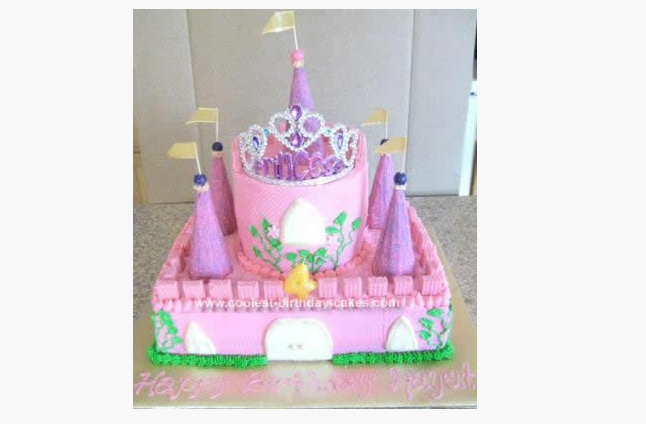 Buy a princess castle, put it on top of cake. BAM..princess cake and a gift! I just did a train cake and put a toy train on the base cake..it was a big hit! What about dress up clothes? The most popular gift I gave my now 12 year old granddaughter when she was small was a set of 15 or so 1 yard square pieces of material. Purchased from the bargain bin at the fabric store. Pinked the edges. I know it sounds silly, but those pieces of fabric have been tablecloths, blankets, costumes, theater curtains, and a whole host of other things. Stole the idea from Hearthsong catalog - where they have a beautiful set of play silks. Finances never allowed those, and in the end it didn't matter. The cotton pieces have been used, washed, used, washed, used and used and used. Best $20 I ever spent. Hands down. Oh my gosh, that's brilliant! By the way we gave them the castle two Christmas's ago and they still play with it. Balance bike. My #4 turns 4 on Sunday and he is almost riding a big bike because the balance bike helps so much! I'm low on birthday ideas for him too. He has an older brother and triplet boy cousins that pass down everything. Today he said he wanted a "remote control volcano." O-kay! My 4 year old loves her Duplo sets and also really loves Playmobil (those sets have tons of tiny little pieces though!) To keep her younger brother from getting into it and destroying her creations, she keeps it in her bedroom and plays with it during her quiet time or when she just wants a little time by herself. Here's a set that's not TOO awful in price and the colors are beautiful. And they got a 5 star review from a children's librarian, who should know what will hold up and what won't. Some of Grace's faves: dress up clothes (check Goodwill for fancy dresses, too! and old lady hats), tutus, big and small MagnaDoodles (though similar to that other toy you posted about), and anything crafty. A lot of her crafts are for when Soph is otherwise occupied, but Grace is into sending mail/cards, drawing on construction paper, using markers and copious amounts of tape (a birthday gift). I don't love Amelia Bedelia for her yet, since they're a little above her comprehension level and take forever to read. She really loves the How Do Dinosaurs Eat and the others in that series and Franklin books right now. 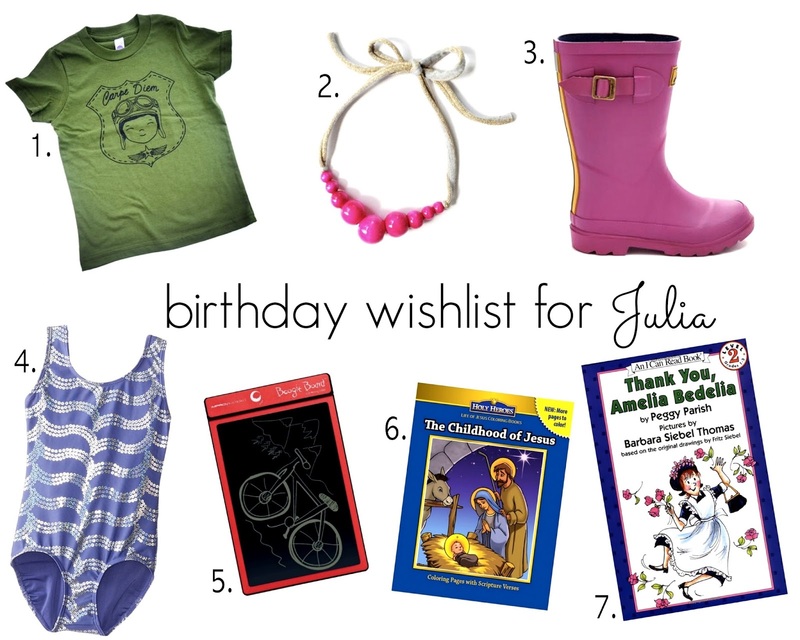 If Julia is into ballet, I'd capitalize on that with some stuff she needs for her class! Sorry for the novel, hope it helps! P.S. For Sophie's first birthday, I bought four grocery store cupcakes and it was awesome. Underachievers forever! 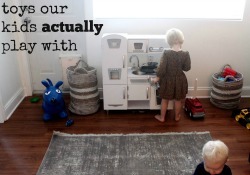 Do your kids have a play kitchen or fake/plastic/felt food? I used to LOVE that kind of stuff and my nieces and nephews do too. 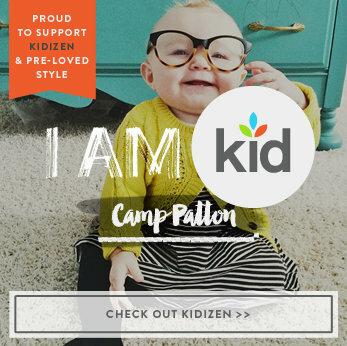 I cannot wait until my niece is old enough to get her something from this site! Yes, I was going to suggest this as well. Was a favorite activity of ours!! This is the exact set of blocks my son had. He played with them for years and his sister even got lots of use out of them. This would be a great gift for Julia that all the kids could enjoy. Plus they are soft so they don't hurt when the tower falls. Also, I love the dress up idea but I always purchased costumes after Halloween at a huge discount and gave them to my daughter at Christmas. Note to self: Never let Maddie Grace on Pinterest!!!! My daughter loved to dress-up. We found a little cardboard trunk of dress-up stuff at Target/Wal-Mart when she was little. She used it for a few years until she got too big for them. And she had a tent she loved and would occasionally spend the night in. Those look like some great gift ideas. Also, if I lived closer I'd totally try to help you with the cake situation. I have a nearly 17 month old. I had a jungle theme for her birthday but ended up wasting a lot of money on decorations because the part was outside and with the wind blew most of them down and the gazebo looked stupid. I love the birthday presents! Julia seems like she's a girl with a plan and she know what she wants. Love it! I used to do birthday parties also, but it is SO not my charism. And the whole party bag situation is out of hand. So I don't do that either. I've gone to "not everyone gets a friend-party every year" at our house and the kids are handling that just fine. So about every other year, one or another of them can do something with friends. I'm all about the "experience" party - a jumpy place, a park, a movie, etc. Any place but my house. That being said, we make a BIG deal about birthdays in our own family. So the birthday child gets to choose their own dinner, their own cake (thank you Cake Doctor book of genius), they get presents, etc. They are generally feted the entire day by the whole family and that's what makes the birthday special. Then, for "special" birthdays like 16 or 18, we go all out. Though I'd probably never stop reading, so craft away, my friend. I'm no help in the toy department (love the idea of a tent though)! As for books try Fancy Nancy or Pinkalicious. Great for 4-5 year old princesses! I saw someone suggested magna tiles. One of the only toys we have that all five kids play with (9,7,5,3 6months). Also a good agree for a two wheell scooter. My three year old daughter lives on hers. It is a great way to learn balance. Our rule is one they can learn to balance with both feet on they can try a two wheel bike (so far all have learned when they were four or five). This is when I wished I lived closer. I would happily with great joy make Miss julia the very BEST princess cake on the planet. One of my charism's is baking and pink frosting is at the top of the list. LOL! Can't believe she is going to be four! Time flies when you're having babies! love you friend. Not sure if you want to give Julia an even BIGGER stage to perform on (a girl after my own heart) but something like a standing puppet theater might be super awesome.. Example from the Land of Nod: http://www.landofnod.com/off-broadway-puppet-theater/f11518 otherwise I'm sure there are plenty of ones on Amazon. Great for your other little ones, too. BB&B sells a VW camper tent that my kids are obsessed with. It retails at $59, but who doesn't have a 20% coupon (or twenty) hanging around the house?? I have filled the tent with a package of 100 ball pit balls and it entertains for hours. Also a great storage solution/reading nook/place for mom to hide from kiddos. Good luck!! I'll make that cake for J... know of an easy way to ship a cake across the country without it getting destroyed before arrival? We tend to approach toys as "learning tools" --- so things like bikes, easels, Duplo, dolls are all in, while stuff like character/licensed rocket ships and ponies are out. Those things get purchased by the family anyway ;) So yes, those things above are my suggestions, albeit rather major ones. Other smaller things might include craft supplies (a cute little pencil case filled with special new crayons or pencils, stickers, safety scissors and her own roll of sticky tape), play dough tools, sticker activity book, small seedlings to plant in pots/garden, an umbrella, a junior board game like Guess Who or memory, some sports equipment like balls and bats, etc. Basically -- things that everyone can use and share but are still exciting to open! If you want a lazy awesome birthday cake, just use a box mix to make a bundt cake and then stick a Princess Barbie in the top part so that the cake (frosted pink or something and covered with obscene amounts of sprinkles) is her giant skirt. Yes, that is lazy and messy. But it pleases many a little girl and involves little to no work. I'm with all of the people who suggested dress up clothes. The way Julia loves to dance, I'd suggest a sparkly tutu or a skirt that twirls. Capes, too, are AWESOME!! As for the cake, I happen to work in the Betty Crocker Test Kitchens, and we've got some cakes that EVEN YOU CAN DO!! Check out this link, and scroll down to the Royal Princess Crown Cake. There's even videos (made by my friends!) to help you out with the details. Let Julia help and she'll love it no matter what. this sound silly but i LOVED boxes, purses, old fashioned suitcases when i was little. LOVED THEM. my parents still have my plastic lunch box which I called my "floo fla" and carried around like a briefcase. dang i loved that thing. 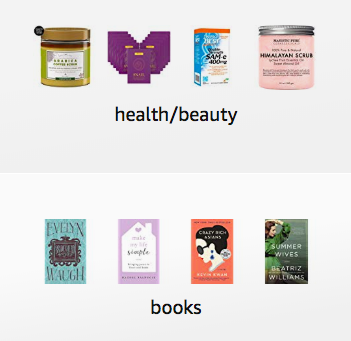 it could be really cute if you get her an old fashioned suitcase/ lunch box/ something (preliminary search here http://www.amazon.com/Cargo-Cool-Euro-Suitcases-Soft/dp/B003TLNI2Y/ref=sr_1_2?s=furniture&ie=UTF8&qid=undefined&sr=1-2&keywords=old+fashioned+suitcase) and you could put the coloring books inside as well as stick on dora stickers, glitter stickers (http://www.amazon.com/SALE-Glitter-Foam-Heart-Stickers/dp/B00GMT4Z86/ref=sr_1_15?s=office-products&ie=UTF8&qid=1411011850&sr=1-15&keywords=glitter+stickers) and some ~~* special **~ colored pencils or crayons or something and tell her it's a special box or container for her special stuff and she could decorate. better yet buy a j sticker and she can put that on too! another thing my mom always did was buy paper streamers and make a "toy ball" out of it. you just buy streamers and then slowly wrap it around little trinkets/ toys/ fun stuff. it might be better with kids that are a little older but it could be so fun for her to have the looong crinkly paper streamer! i think she wrapped it around a small toy to start, then individual stickers, then bigger things like a new hair clip or a "family coupon" like one foot rub or something. ahhh pack the tutu and dress up clothes in one of these suitcases!! and like a long string of sequiny ribbon! oooh my goodness i wish my family had little girls so i could buy these things...! I've found most of my favorite blogs through you, so there's a good chance I found this one the same way. However, just in case you're not familiar, I was reading her post today and thought of you. "A long day with a toddler is a long day with a toddler (I wish I could explain that better?)" 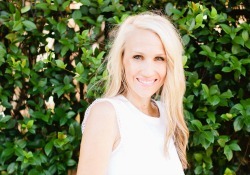 http://elizabethivie.com/ As always, love your blog and the Campers. My almost four year old loves Amelia Bedilia! She drives me bonkers!!! Tutus + pandora station foreva. I got Jordan a glitter tutu at toys r us for $4 and Sean finds some kind of edm/euro pop pandora and it is a partay circa the witching hour everyday around here. We tell them it's a special music station just for them (weston drops it like its hot already too). Is our cheap showing?? So I've madea a ton of cakes and cupccakes (we did 300 hundred for this one function, major icers thumb after that) seriously I think you could do a cute castle or princess cake- you know the cake with the barbie sticking out and the cake is her dress, every kid needs one!! If you need some help I could give you a few tips, my cousin and I made a minion cake for her little boy, flip that was a mission! I'm not sure when the big day is and if there is time (shipping time) but pretty paper straws always make a party! Please msg me for c/o straws from me ...we have princess colors, www.etsy.com/shop/twigsandtwirlsllc. My daughter is about the same age -- and right now loves everything baby/doll. She's been dying to get her hands on the new Mooshka dolls -- and the thing I love about them is they don't do anything special! They are just really cute. All cloth. Adorable faces. But they force the child to use their imagination when playing with them - instead of the doll doing the things on it's own! I might suggest the "mr. Putter and tabby" series of books. They are incredibly delightful and would appeal to your boys, as well. They are the best! So many comments and I haven't read through them all to see what people suggested already! My 4 year old loves dress up clothes, barbies and the one toy she has had forever that she uses every single day is a simple magna doodle....she loves to draw and create on it always! I did see some play doh mentioned and I would say a big fat no to that as it is SO messy and you will be finding play doh pieces forever and a day in your house. I only let my daughter play with it outside, ha! Also, that Jones Market little lady necklace is adorable....I just LOVE her necklaces, I have 3 and always feel like I want more!!! Happy shopping and good luck on that bday cake, ha.....I am in no place to help in the bday cake department as my local grocery store does a good enough job that I don't try and compete with them!!! Just wanted to chime in on the Amelia Bedelia front. We got the kids an AB book from the library one day because I, too, had fond childhood memories of her antics. Maybe I'm jaded, but I found myself getting super annoyed at a grown lady being so stupid. My kids, on the other hand, loved it. There was a bit lost in the generational translation (my kids didn't know what "drawing the curtains" meant, so the humor was lost on them when AB sat down and actually drew the curtains), but they loved it. Also, the book we checked out was a collection, and they thought it was super important and fancy how I said we'd read it in "chapters", one chapter a night. So yeah. The takeaway from this comment: AB = heartache for parents, joy for little ones. Definitely princess dress up items! you can totally pull that cake off. one 9 x 13 on the bottom and a 9" round on the top. it won't be as tall, and you could always turn an empty pot upside down to set it on to give it the height (and then frost it), or not….and then yes, use cones and half cookie wafers to make the rest. I second (or whatev #) the duplos. Safe for all ages and all of my kids phase played them for years. Also love a toy stroller/shopping cart if you can stomach the squabbling over it. My kids love playing games (maybe because that and reading books are only activities I do with them?) But almost all do have multiple pieces to deal with. We've been doing lots of candy land and memory over here. An art or project kit had also been a hit for Christmas - fill with whatever you can tolerate. Kid size table and chairs and play kitchen? Ride on toys...balance bike, plasma car. Don't know if I'm repeating other comments because I haven't gone through them all but maybe a costume trunk with a few fun and funky, shiny items inside. Maybe a kid's indoor tent or tipi for some fun fall/winter play? I bet it'd be pretty easy to make a cute one! I've seen so many ideas float around the internet for these. As for the cake - just slap a crown on a round cake and call it good? love the writing tablet, too. That's awesome. Hah. I tried baking a no-sugar/vegan/what the hell was I thinking cake for Anabelle's one-year old birthday party. What a total waste of time. She hated it, didn't even try to pretend she liked it and only ate the raspberries on top. Luckily, we had mini cupcakes from the local grocery store that we gave her and she totally loved. That's why people run bake shops because some of us aren't that talented in the baking department. My girls (aged 2.5 and 6) are really into super hero capes. My SIL bought some cheap silky fabric a few years ago in 3 colors. She uh...burned...the edges so they wouldn't unravel. I think it was burned, cause she totally didn't use needle and thread. My MIL made them fancy shmancy capes recently, but those fabrics are still their go-tos. Also favorites in our house--tea sets (bathtub ones so they can use them outside for their never ending mud parties), chalk (otherwise they get into my husband's charcoal stash and he gets gruuuumpy), purses, play food (for said messy tea parties), buckets and shovels. And band aids. Seriously. OH Amelia Bedelia. We have an almost 3 year old daughter and bought a "learn to read" Amelia Bedelia book when my daughter was, maybe less than 2? But it was on sale and I also remember AB as being so funny and i loved her when I was younger. Funny enough, my daughter now requests that we read that book every night (along with Danny & the Dinosaur and Harry the Dog). 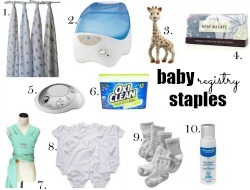 I think your bday wish list for little J is perfect!!! She will love any of those gifts. I'm sure of it! My daughter just turned four last month. She loves stickers and construction paper to play with. I guess it's messy, but she loves to play with it and it helps her motor skills.. and mine! She is also really getting into barbies. I have zero input on gift ideas but felt the strong urge to agree that Amelia Bedelia books are my FAVORITE. If you get this far in your comment reading- I got my girl the book No Fits Nilson this year and we love it! Available through amazon so double win. I hate buying more toys so I'm no help there. And I think she needs that awesome green t-shirt and I think my own little lady does too. Good luck!!! (And bake a cake from a box, frost it from a can, decorate it with plastic princess figurines. So easy but wows the preschool girl crowd). We did a rainbow party a few years ago -- I Pinterested an easy "rainbow" bundt cake recipe and frosted it with whipped cream. Cut the cake, and it is a nice u-shaped rainbow! All we needed were fruits and veggies laid out in ROYGBIV fashion on trays, PBJs, and a take-home craft to take up some time. I loathe goodie bags like Ebola -- but was willing to spring for a bunch of small white tees and some basic fabric paints from Michaels. It really was a $50 birthday party and everyone, moms and kids, loved it. Nothing against the nice people who can pull off an elaborate themed party, but I think everyone was relieved to witness a party like those of yesteryear -- homemade cake, simple food, etc. Half the kids ditched the tees in favor of playing tag in the backyard, which got a lot of wiggles out. I just found your blog and I'm dying over here. What hilarious kids. I love throwing big birthday parties but I think it's purely selfish as I don't get any other creative outlet haha!